The Todd family did extensive work to the gardens, bringing in exotic trees and plants from all over the world. 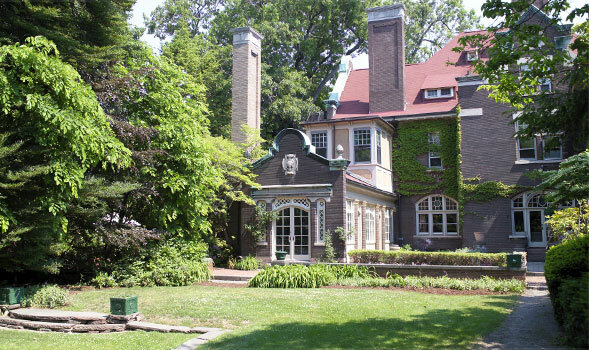 The garden is one of the few remaining Depression Era gardens designed by famous landscape architect Edward G. Lawson. As one of the founders of the idea of “private works projects,” Libanus Todd employed many people to work on the gardens during the depression. The brick garden wall was built during this time and several improvements and additions were made. At the far end of the garden is the Japanese teahouse which is said to predate the Strong-Todd mansion and was originally larger than it is today. Steve Fennichia, a well known gardener whose brother is famous for developing several varieties of lilacs, served as the gardener here for more than 30 years.